Don't have a fine-mesh strainer? Click here to buy an inexpensive one on Amazon! You can also skip that step by using a clean dish towel to wring out the water. To do this, first let the cauliflower cool. Then transfer it to the center of the dish towel, and wrap the towel up around it. Wring it out over the sink, getting rid of as much liquid as possible. The world needs pizza -- it's a fact. That combo of melty cheese, zesty tomato sauce, and crispy crust is magical. The problem is that standard cheese and conventional crust pack too many calories, especially considering one little slice of pizza ain't gonna cut it; we want several slices or, even better, our own personal pizza. That's why we came up with this new recipe. Instead of putting veggies on top, we put 'em on the bottom! 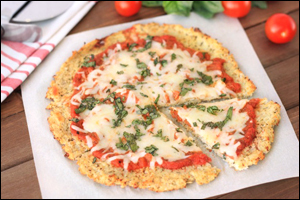 Our cauliflower crust pizza is so darn flavorful, you may very well lose your mind. 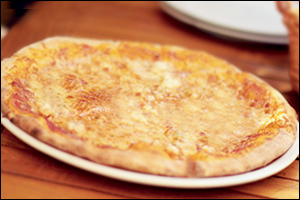 Make it ASAP, and you'll think twice the next time those pizza-delivery flyers start calling your name. Click "Send to a Friend" now, because everybody loves pizza. EVERBODY.